See what happens when you strap 3,200 horsepower, Arneson surface drives, and Rolla surface-piercing propellers to a 51-foot boat. At first glance, the Magnum 51 Bestia might make you feel as if you’ve been time-warped back to the ’80s, when Sonny Crockett and Rico Tubbs were chasing drug kingpins around Biscayne Bay in the popular television series “Miami Vice.” In fact, the paint scheme of the Magnum 51 Bestia I ran across at its launch during the 2014 Fort Lauderdale International Boat Show immediately reminded me of Crockett’s legendary Wellcraft Scarab 38 KV. The Magnum 51 Bestia aims to provide speed, luxury, and comfort in one package. The 51 Bestia (that's Italian for “beast”) is a very different animal compared to those go-fast boats of the ’80s, however. Yes, of course it’s fast—70-plus mph fast. 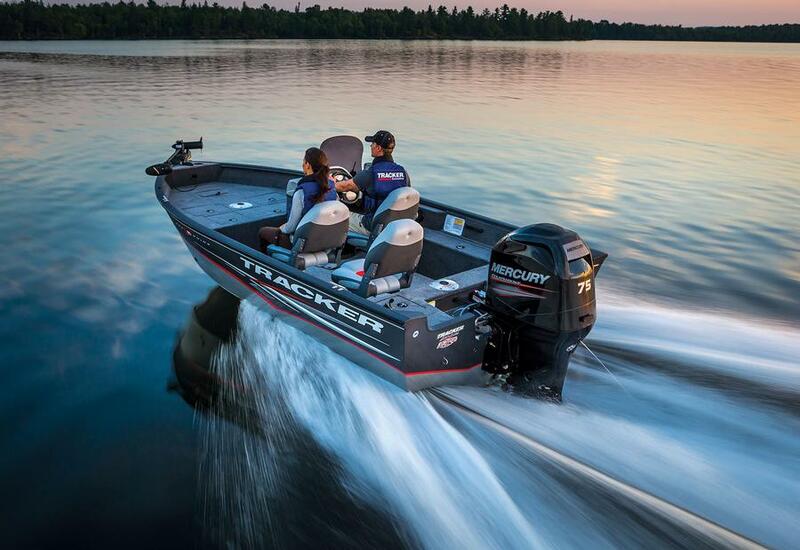 But speed isn’t what this boat is all about. 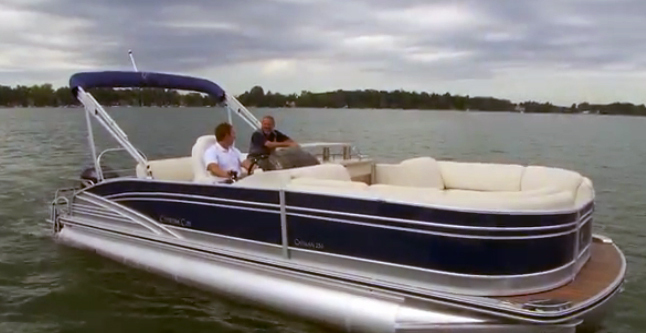 What’s special about the Magnum 51 is its ability to run those speeds in ultimate luxury, comfort, and safety. Seventy miles per hour on a calm, costal bay is no joke, but doing 70-plus mph comfortably on the ocean with a boat full of guests is an entirely different ball game. Hold on to your hats, this is going to be quite a ride. Magnum Marine has quite a history in the performance boatbuilding arena. Founded in 1966 by Don Aronow, who had just sold the Donzi factory he built in Miami, FL, Magnum Marine was bought by a Chicago businessman in 1968. An Italian from Rome, Marchese Filippo Theodoli, became the first exclusive European Magnum dealer in 1969, and then went on to buy the company in 1976 with his wife Katrin. Theodoli passed away in 1990, leaving a legacy of incredible luxury performance boats behind. The boatyard and business were left to Katrin. Irritated by naysayers who told her no woman could ever successfully run a boatbuilding company such as Magnum, and wanting to continue her husband's legacy, Katrin immersed herself in learning everything she could about the business and boats—including figuring out how to drive a boat in secret. 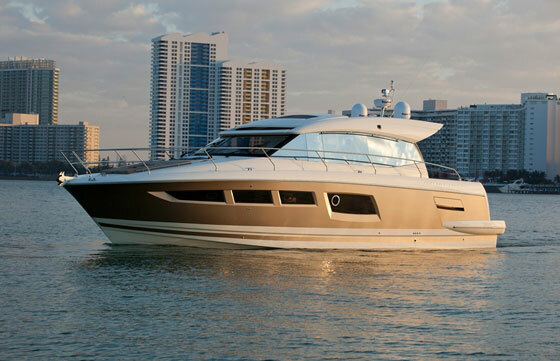 Still involved in the business today, Katrin was at the Fort Lauderdale Boat Show aboard the new Magnum 51 Bestia. She exudes the same confidence, elegance, and boldness that her boats do. While that may sound corny, I think Katrin’s elegant yet feisty spirit is an important part of what these boats are all about. She’s the beauty to the Magnum line’s beastliness. The Magnum 51 Bestia. Note the Arneson surface drives and surface-piercing Rolla propellers, aft. The Magnum Marine lineup today consists of six models ranging from 44 to 100 feet in length, and all are built in Aventura, FL. 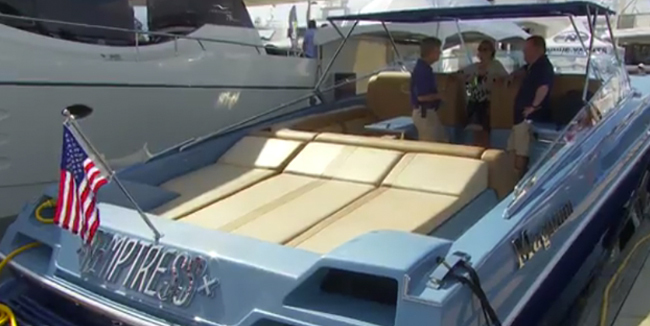 The Magnum 51 Bestia, brand-new at the 2014 Fort Lauderdale Boat Show, actually began life in 1993 as the Magnum 50 Bestia; it was the first new model launched by Katrin after her husband’s death. 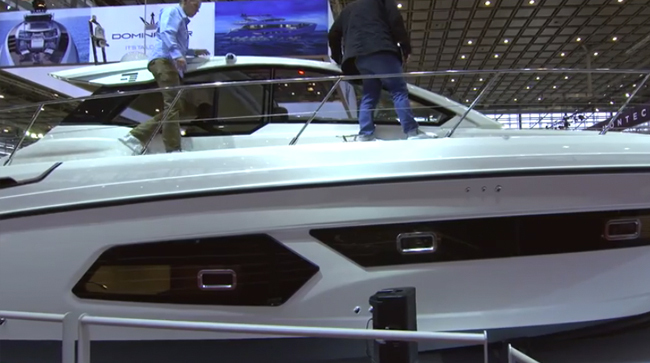 This new model is lighter, slightly faster, and more efficient than the model it replaces. “This boat has been thoroughly refined and improved, but it still slices through ocean waves and rollers like a knife,” Katrin told me. Speed and performance are delivered by a pair of 1,600-horspoewer MTU 10V 2000M94 diesels mated to Arneson surface drives tipped with Rolla NiBrAl surface-piercing propellers. Katrin said that the 51 Bestia can top out at 74 mph with this setup, burning an amazingly efficient 100 gph at that speed. Reasonable and efficient cruise speeds settle in around 55 mph, though for the best combination of both speed and efficiency, I’m told 45 to 50 mph is the best range. A pair of 1,950-horsepower MTUs are an option. Twin, 1,600-horsepower MTU diesels sit tucked away in the engine room, waiting to get down to business. While the speeds that the standard power plants deliver are impressive, feeding oxygen to those huge diesel dragons is an engineering feat in itself. Of course there are large vents peppered around the exterior where the engine room sits, but there are also two cleverly concealed, crescent-shaped air inlets on the foredeck, which at speed force-feed tremendous amounts of air down into the engine room. That engine room is tucked beneath a richly upholstered sun pad that hydraulically raises and lowers to provide easy access to the engine and mechanicals. A teak-decked walkway runs past the starboard side of the sun pad back to the stern, where you’ll find a large, welded metal swim platform that acts more to protect folks from the surface drives—and vice versa—than as a place to lounge. Just ahead of the sun pad to port is a large and plush, L-shaped seating area set around a small fiberglass table that I wish was larger, but that would interfere with an access hatch in the cockpit sole. Besides, cocktails and party snacks at 70 mph? Nah. The helm is situated all the way forward in the cockpit to port and has a leaning post/bench combination set behind it. The dash is surrounded by curvy molded fiberglass that gives it a futuristic look. Inside its boundary are a large multifunction display, Arneson drive control toggles, engine gauge panels, control switches, stereo head control, and other various switches and toggles. Visibility from the helm is excellent in all directions. Across from the helm, to starboard, is a bench where two can hang on for a wild ride. 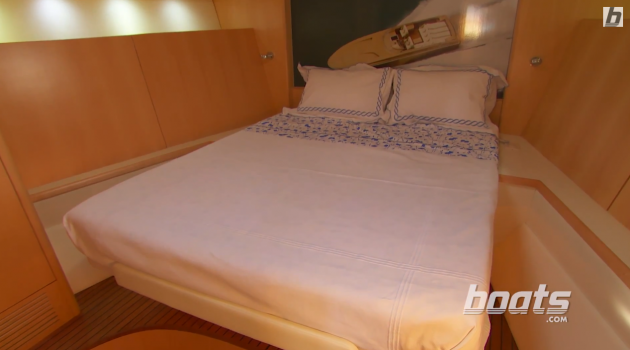 The master stateroom on the Magnum 51 Bestia has a large, centerline berth tucked up into the bow. Down below is a handcrafted interior that is remarkable, especially for a boat designed to top 70 mph and cruise in the 50s. Down a set of steps is the main saloon, which has a U-shaped dinette and table to port. The table drops to form a large berth when needed. There’s a long settee to starboard, and forward of it is a simple galley with an electric cooktop and a small sink. The model I was aboard had a beautiful interior with light-colored woods, leather, and fabrics, but as a custom builder, Magnum will build it any way you like it. Forward is the master stateroom, which features a centerline queen berth tucked into the bow, a large hanging locker to port, and a fully enclosed shower/head just aft of it. There’s also an option for a layout with crewmember or captain’s quarters set just ahead of the master stateroom with its own entry. Ventilation and natural light are somewhat limited. OK, now for the bad news. Acquiring one of these beasts is going to set you back north of $2.5 million. But if hopping over to your island estate in the Bahamas before returning to film on location in Miami is on your itinerary, this is the right beast. 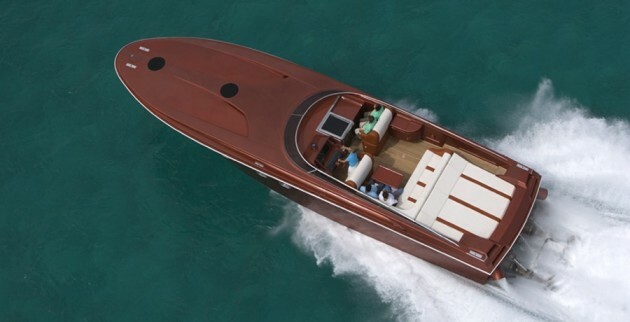 Other Choices: The Bestia is a one-of-a-kind creation, but you can find out about five other high-performance speed boats in this size range in Go-Fast Boats: Five Fabulous 50s. View Magnum 51 Bestia listings. 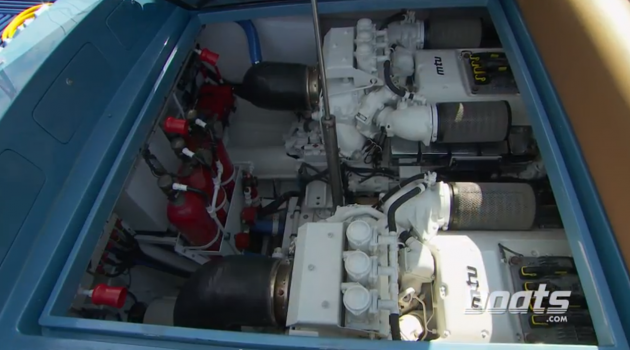 For more information, visit Magnum Marine.